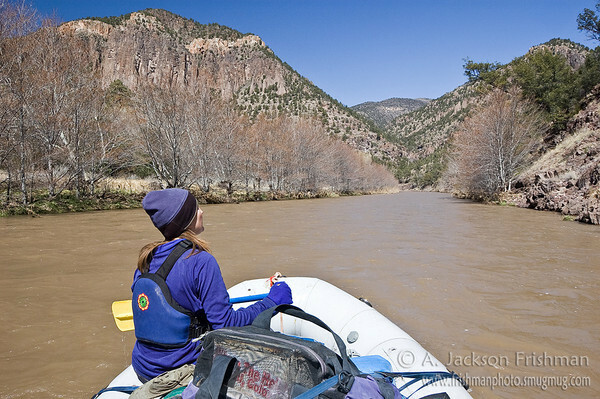 There’s very little info to be had, online or in print, on boating the Gila River. It’s nice that way. 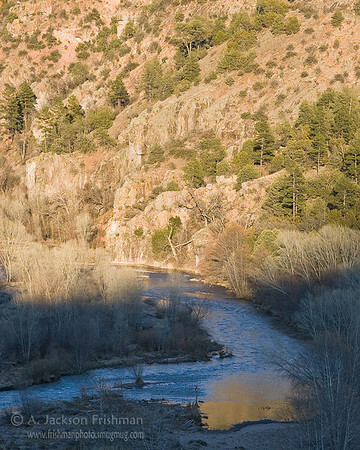 The Gila Wilderness Run is one of a very few remaining in the American West that can provide a multi-day rafting trip, but has no guidebooks, no commercial outfitters, no lists of rapids to scout or popular campsites and side hikes, where once you launch you literally have no clue what’s around the next bend. I don’t want to change that. I’ve only read one decent account (link updated 3-1-15) of the run online. Dutch Salmon’s book Gila Descending is an excellent read, highly recommended, but it isn’t practical advice (unless you’re bringing a cat down the river). This trip report is intended to provide inspiration, share some pretty pictures, and maybe give a little logistical info. 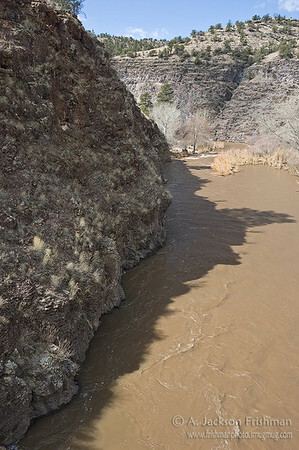 If you’re aiming to float the Gila, you probably want an El Niño year. I had been watching reports of heavy snows piling up in southwestern New Mexico all winter, and as February dragged into March, the Gila season started looking really feasible. We had been planning a four-day weekend looking for wildflower blooms in Arizona, but flows were looking good, snow was still falling and I was able to borrow a 12-foot boat. The forest service was reporting 110 inches of snow on Whitewater Baldy and telling backpackers to stay away, as creek crossings would be problematic. Perfect! With a week’s notice we changed plans and started packing. For our shuttle, we used Gila Backcountry Services. (Update: As of March 2016, Gila Backcountry Services is, sadly, no longer in operation.) Their price was reasonable for a three-hour (one-way) shuttle, they were very helpful and nice, and lived very close to the put-in: recommended. The Wilderness Lodge might be another option. For maps, I simply got two custom printouts from The Travel Bug in Santa Fe, and annotated them with mileages from here (Updated link March 2016). 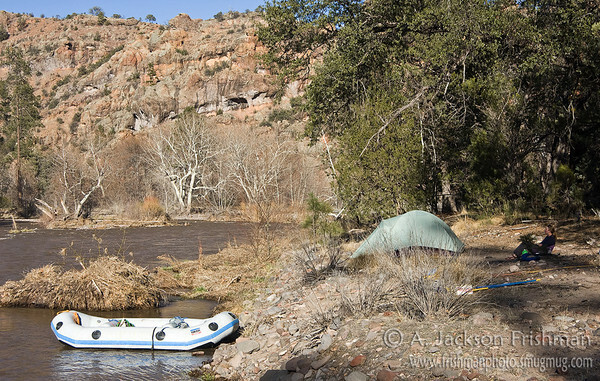 We launched on Friday, March 19, 2010 at Grapevine Campground where the East Fork meets the main Gila. Rigging was fast with only one boat, two people with backpacking style gear. We soon pushed out into the swift and muddy East Fork, floated 30 yards into the even browner Gila, under the bridge and into the wilderness. 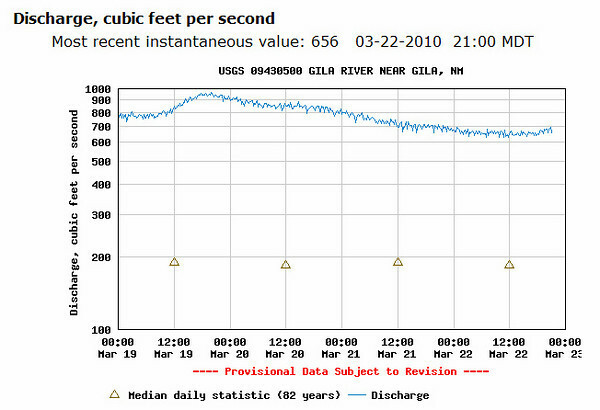 The Gila moves right along, at least at our relatively high flows. Even the flattest spots have strong current. The nearly constant theme of Gila whitewater is blind corners, and there’s absolutely no way you could scout all of them. You’re constantly craning your neck trying to see around the vegetation, looking for any hint that there might be a tree across the channel while there’s still time to eddy out. Sometimes you drift around the corner and see that all is clear, other times you still can’t see but it’s too late to pull over and you hope for the best. If you’re thinking of running this stretch, I’d say that the number one qualification is that you’re very confident reading water and making and changing plans on the fly. There’s nothing terribly difficult, but there’s an awful lot of it, and you couldn’t possibly scout everything, not even close. If you’re less than comfortable improvising in Class III water, it could be a very stressful and not particularly fun trip. The first couple miles provided a good warm-up. We pulled over for a break at Melanie Hot Springs, a nice little hot pool, somewhat but not overly ridden with algae, big enough for two. It would be pretty nice on a cold day or after days of backpacking up the river trail. But an hour into our trip, it wasn’t so inviting. I warmed up my toes a little, then we headed on down and ate lunch in the more open country around Alum Camp. After lunch the clouds started building, giving an ominous aspect to the canyon as it tightened up and grew fast and twisty as the river entered Murdock’s Hole. When we saw an inviting terrace well sheltered with prosperous ponderosas, we opted for an early camp. The first big drops started falling just as we got our rain fly on. We hunkered down and snoozed through the downpour. A clearing storm at evening; dinner; a cheerful fire in a forested canyon in deep wilderness: it doesn’t get much better. After a very chilly night, I got up early in the morning and bushwhacked uphill in search of photogenic views of Murdock’s Hole. Once we launched, we were treated to several very fast and fun miles through the remainder of Murdock’s Hole. 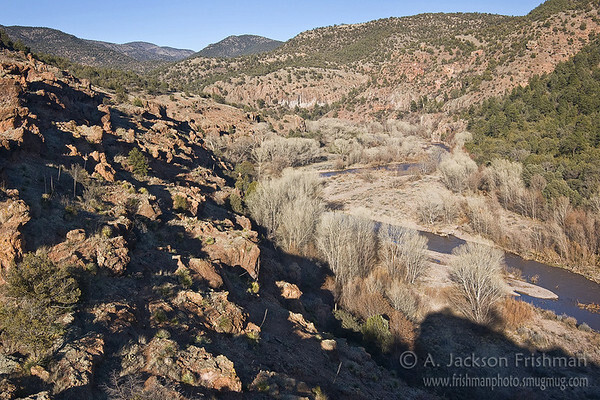 Besides the blind corners, the other distinguishing feature of Gila rapids are very tight bends where the river constantly wants to push you into the walls. There were lots and lots of these. We scouted a couple times, once at an unexpected and quite dramatic spot where a 40-foot-tall island of bedrock split the river into two channels. The left was obviously wide, but largely invisible; the right was tight but clear. We shimmied through the right, but looking back upstream, the other would have been better. So far the river had been mercifully free of the dreaded strainers, but at last we came to a sizable trunk fallen most of the way across the river. We opted to line it. From here, the river flowed again into somewhat more open country around the foot of Granny Mountain. After lunch, we hiked a ways up the Granny Mountain Trail, with terrific views. 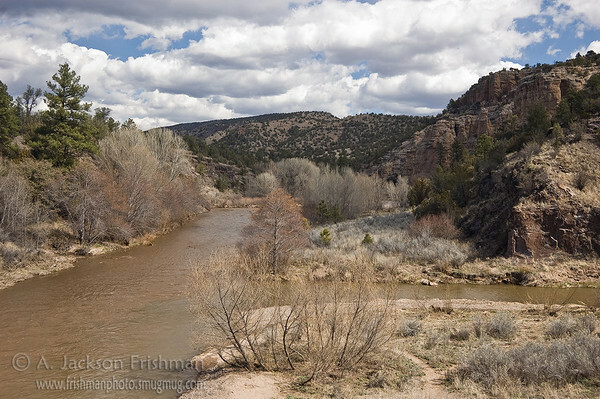 The river itself was pretty muddy for drinking water, not really feasible to treat, but anytime the Gila is runnable, there ought to be plenty of side canyons running. We had filled up at one unnamed canyon that morning. Sapillo Creek was too large and brown, but Snow Creek, just downstream, was running large and clear. Though it was still rather early, both in terms of mileage and by the clock, we couldn’t resist a gorgeous camp on the downstream arm of a tight horseshoe bend near Sapillo. In addition to a luxurious site, it was easy to climb the ridge inside the horseshoe, and my best photography of the trip happened there. Splendid as our camp was, once we started floating the next morning I almost regretted our early stop. 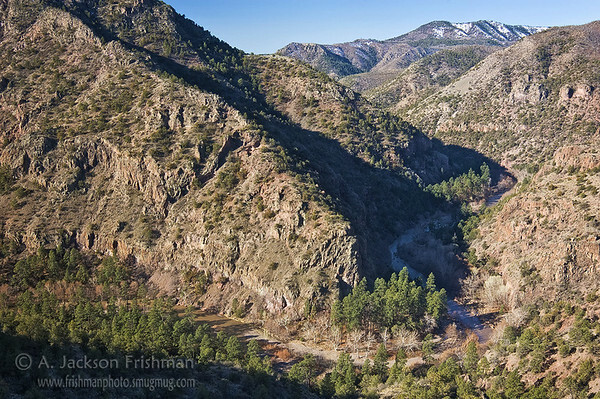 We had quite a few miles to make that day, and the canyon below Sapillo Creek was spectacular. The cliffs became more varied, sometimes broken and craggy, sometimes sculpted and creamy welded tuff. The riparian vegetation was getting quite lush, with plenty of giant sycamores and oaks mixed in with the ponderosas and willows. Hints of spring green were beginning to show. The south-facing slopes were covered with prickly pears and sotol. One thing notably and happily missing was any hint of tamarisk. I don’t know what factors are keeping the invaders out of this area, but long may the Gila remain free of them! The whitewater in this stretch was a blast, rapid after rapid, some with the biggest hydraulics we’d seen, sometimes up against the cliffs, other times overhung by tree limbs. It’s the only time I’ve run water features formed by tree roots. We broke for lunch at a gravel bar by a beautiful park shaded by huge trees, at another horseshoe bend. I longed to spend the night, but we were still a good 15 miles from takeout. The float after lunch was graced by a beautiful waterspout gushing through a sculpted groove straight into the river, and many, many rapids. We filled water, not bothering to treat it, at a large spring gushing directly from the ground by the river bank. The rumored cliff dwellings near Hidden Pasture Canyon were not readily apparent. but slightly downstream from there, we chose the wrong channel. The left channel was thoroughly blocked by a tree in the water. With few options remaining, we wedged our raft among some boulders against the cliff wall. Five minutes of yanking and low-siding got us through. We camped a mile or so above Turkey Creek under a huge cascading oak limb, and enjoyed the evening light. Our last night was substantially warmer than the others. We packed up early and headed on, stopping for water at the huge clear stream of Turkey Creek. We drifted on, remarking on crossings we’d forded two autumns previous, now deep under water. A couple vehicles and some hippies tinkering under the hood of their Subaru at the Turkey Creek road let us know we were out of the wilderness. 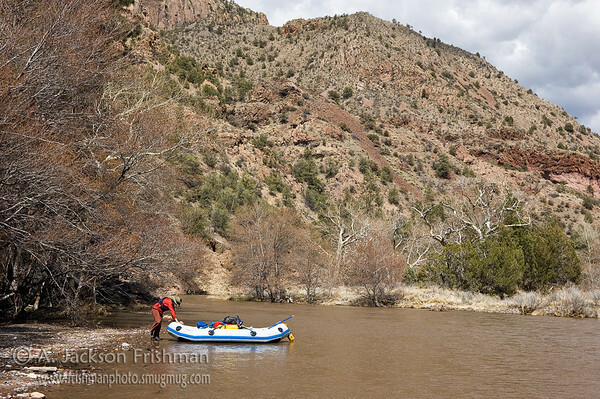 But solitude soon returned as we floated on mellower water through the twisted foothills of the Mogollon Range. Downed trees became more prevalent down here, but only once were we forced to drag the raft over a gravel bar to another channel. We finally passed the guaging station, floated out of the canyons and arrived at the Mogollon Creek confluence, our takeout. Our shuttle driver had kindly parked our car in sight of the river. There may have been better takeout spots downstream; I’d advise you to check, especially if you run your own shuttle. 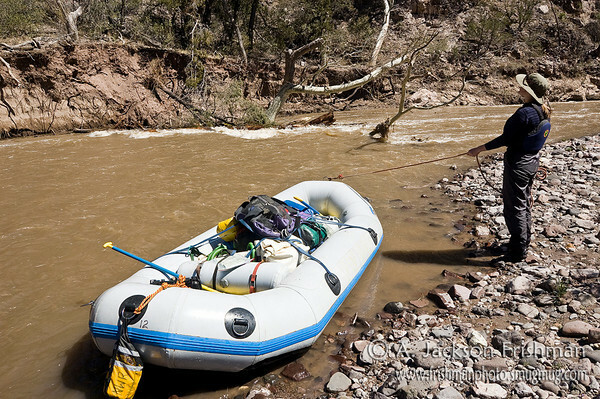 But we ended up unloading the raft, dragging it over the gravel bar to Mogollon Creek, throwing our gear back in, crossing the creek and unloading. 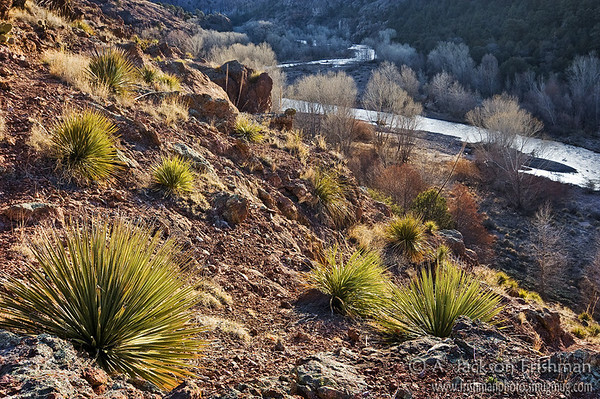 Small trip, quick takeout: soon we were on the road through Catron County, the great New Mexico outback, ephemeral streams running everywhere and snow on every peak. Awesome! Not exactly the images I had preconceived but pretty close. More texture, more relief and I had no good idea of the veg. Great to see oaks. Also I think I always picture NM baking under low-latitude sun, so I really liked how you captured that early spring light and a sense of the temp. I especially like that shot of the side lit ridge with all the shadows, cool contrasts. Nice. I love your images and the format of the blog. Great work, thank you for sharing! Thanks for taking the time to write all that up, Jackson … it’s been a long, long time since we worked the Gila, when Harry was running SW Outward Bound. Brings back some amazing memories. Your photos are fabulous! Any plans to swing through western CO this season? 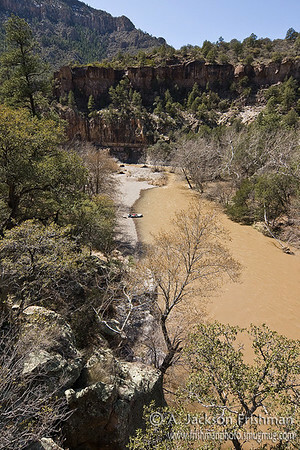 Thank you very much for posting the pictures and info about the float trip down the Gila. I am taking a scout group up here next week and its nice to see whats in store. Adam, sorry it took me so long to notice your comment, the spam filter got it. I’ve seen a few discussions of the Gila on the MountainBuzz forum, but not many have actually done it, it’s usually just folks requesting info. I never found much useful online info in my research. 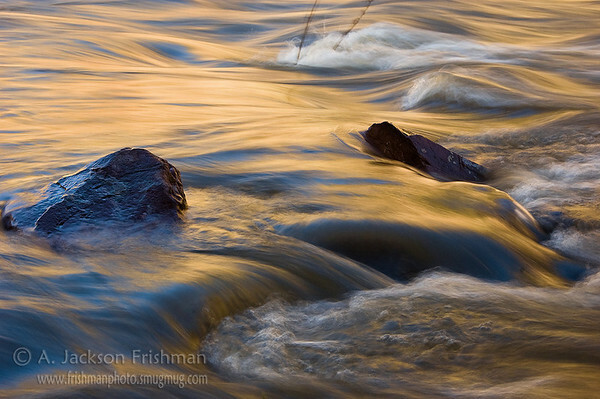 I’d be happy to answer questions by e-mail if I can: frishmanphoto at gmail. What great photos! I loved reading your account of the float. Would it be okay with you for me to post a link from my website to this page? I think a lot of people would benefit from reading your story. run river 1979 blue hole canow. Have you considered NOT writing up your trips into the wilderness. Might help keep it that way. I lived in Silver City for a few years and fell in love with the area. I met Dutch Salmon and spoke with a few locals that floated the Gila but never got the chance to do it myself. I’ll be back there someday. Thanks for the motivation, great photos. Glad you like the report Bill, thanks for dropping by! Definitely grab any chance you get to float the river. I’ll be watching snowpack carefully next time we have an El Nino year. Jackson, do you still have maps or other info for this trip? I’m hoping to do it at the end of this month (march28th). The Paddleon link you describe for the mileage maps isn’t working, and I wondered if I could pick your brain, or have a copy of your annotated maps. Thanks for posting this, with pics too. I updated the link and sent you an email. Feel free to pick my brain! Hello Jackson! Great blog, thanks for the great photos! Since we have an El Nino year upon us, I have been looking for more information about floating the Gila. Would it be possible to get a link to the mileage you used on your map? 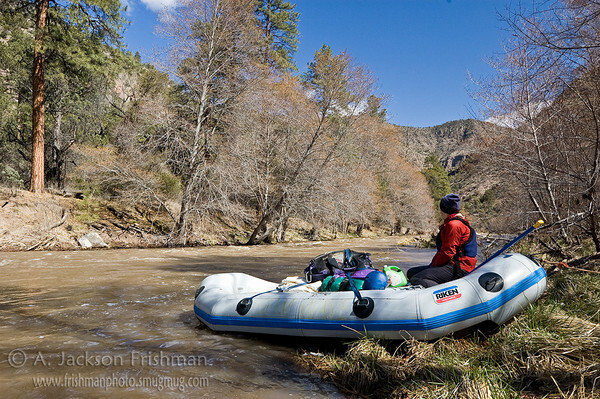 Have you ever heard of folks getting a raft down the Gila in September? Please feel free to email me direct! Thanks so much! Thanks for the kind words! PaddleOn.net seems to have changed their link structure, but you can still get something using the tool at http://www.paddleon.net/PaddleOnMap.aspx. As for September, I’ve hear of people kayaking it on spikes in flow from heavy monsoon rains, but those conditions are so unpredictable, it’s probably only an option for locals. Also, I think people who do that are kayaking it in a day, not rafting overnight. Even if you could launch, your water could (almost certainly would) drop out in a hurry leaving you stranded with a raft in deep wilderness. For rafters, I’m afraid the only realistic option is to look for heavy snowpack in the spring and try to catch the melt. 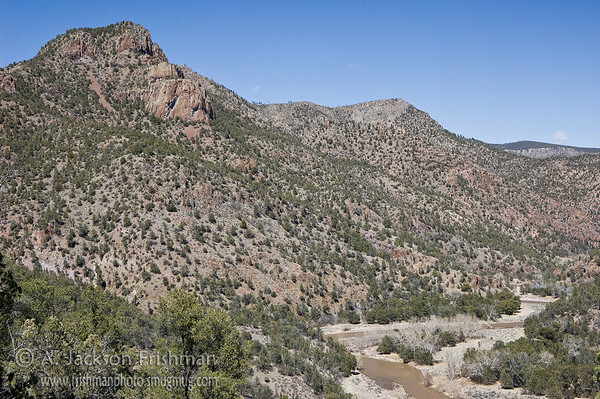 This year is not looking good – the upper Gila drainage snowpack is currently sitting at 16% of normal. This El Nino just hasn’t been all one would hope, and the very warm and dry February really hammered snow levels across the southwest. We’ll have to hope for better luck another year, I’m afraid. or you can study…and then study more…and be ready at the drop of a hat…the Gila dictates when…for me that is the appeal…the appeal of a wild river…one of the only ones left in this country….and no permit required…the only requirements are desire and will…for me the Gila is an obsession…a religion….the meaning of life….a metaphor for life…. Beautiful images and writeup! I have done this trip three times (in the 1980s–I grew up in Lordsburg, NM) with various friends and family, using homemade single rafts of plywood and truck inner tubes. It was always an amazing adventure. . .not always what I would call safe. Now my husband and I are planning to try again in the next couple of years (water levels permitting). I am looking at inflatable kayaks and wonder what your thoughts on gear (and other factors) may be. Your raft looks quite large, so I thought smaller and lighter could get by with less water (we’re not doing it for the rapids). I think we used to run it near Memorial Day, which is a lot later. . .What were temperatures like when you went? Email would be great. Thanks, Cynthia, I wrote you an email. love your story and pics ! …i too am a gila river rafter….some day i hope to get into the kind of water you are talking about in your story…i will work up to it …or die trying….see my Gila here ! Thanks for sharing, Ron, good stuff! Six days – I’m jealous! Thank you for the fine description of this run. I have 2 10 ft kayaks and have paddled the Rio grande racecourse here. And rivers big and small in Wisconsin and upper Michigan. Would this be a run that is doable in winter? Can you please recommend the best launch and takeout? Your story is already helpful and inspiring. Hi Steven, sorry it’s taken me a long time to reply! I’d say trying this run in real winter would be…. interesting, and adventurous. It won’t typically have enough flow in winter. I suppose you might catch a rain-driven spike (looking at the recent hydrograph, there was a huge one around Christmas this winter, so it does happen), but that would be very tricky to catch, might get scary high, and would drop out fast. It would be like trying to catch a monsoon spike (which I hear folks occasionally manage), except cold. All in all, I’d say the outlook would be poor, and you’d have better odds waiting for spring in a snowy year. 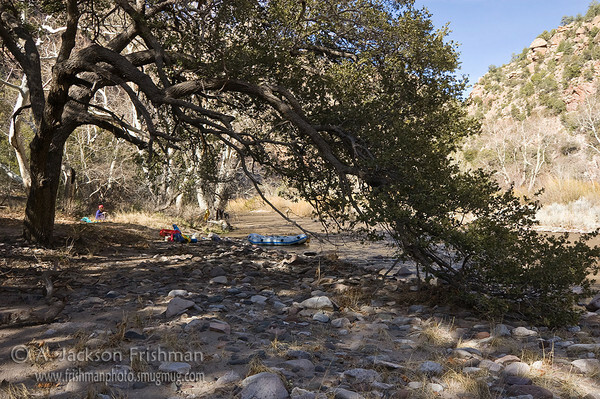 As for launch sites, there’s really only one, at Grapevine Campground downstream of Gila Hot Springs. We took out at the confluence with Mogollon Creek. One could take out at Turkey Creek instead, but it would make the shuttle longer and you’d miss some pretty miles at the end. If the Gila diversion plans ever go through, God forbid, that might change things and make Turkey Creek the only viable takeout.